Eee Pc 10005HA / Eee Pc 1005HAB No power will not charge the battery. I am not sure if this is an emerging issue with the Asus Eee pc 1005ha but I have received a couple of pleas for help on the Eee pc's both the 1005HAB and the 1005HA. If you have one and are disassembling your EEEpc if you could take pictures and/or note the numbers on the transistors starting in "t0.." I'm sure quite a few folks would thank you for it. "I Need the number of the diode on the bottom of the motherboard behind the AC adapter jack can you help me posting an image of that please?" "Hi dude!!! i add u trough ur blog about the eeepc 1005HA, do u still have it?? i need something very important from you, if yes please please dissassemble it i need the code of one transistors , mine doesnt not receive dc in because of that and batt is not charging..
Who do you purchase the diode and the transistor from? In my case, the transistor is shorted between base and collector and the PC will not show any life sign (no lights, no power). Must i change it ? Asus Eee pc 1005HAB power issue...did not properly boot down and was showing in a black screen with an "erasing" message, so I manually turned off with power button. Now I have no power to my computer. Prior to powering down I was installing update for Asus. I not sure if I may have not allowed the down load to finish.Battery was fully charged a the time. If you were in the process of doing a BIOS flash from Asus.... Wow.. is about all I can say.. There is a reason why they say not to unplug your computer during the BIOS update.. because you may end up with a very expensive paper weight.. I would contact Asus Support and see if there is a Flash drive BIOS flash you maybe able to use.. other wise you may be looking for a new netbook sad to say..
i have searched for days and days and cannot find how to replace the power supply fan. i took my eee ha 1005 to the computer shop with it already disassembled to show them the fan and they said i would have to remove the mother board...i have no idea how to do that. any ideas? Same power problem with my unit. Has anyone successfully repaired this issue? Has anyone successfully repaired this problem? I recently followed the article for the HAB1005HAB hard drive removal and all I get is light bulb LED flashing at me. Can anyone tell me what that means, I haven't put in the new hard drive yet but I should atleast be able to get to bios. 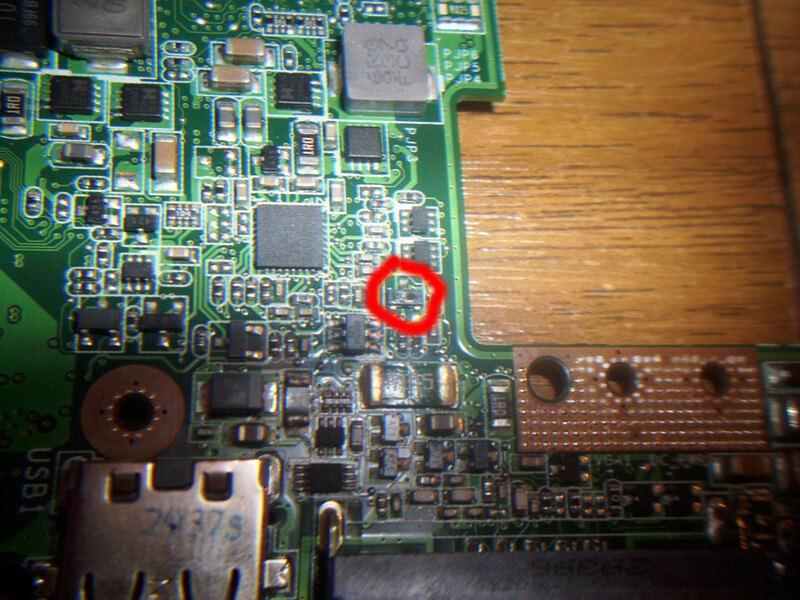 for the transistor it looks to be an W06(98), i'm gonna try to locate them to order and try to fix the netbook. hi. i have the same problem. my transistor is blown and shows only a part of its code t0... and theres other blown component near the jack and behind what i think that are the diodes you refered. Is it the B4 diode you reffer? Can anyone tell what component it is and the code? I got hold of the circuit diagram and the diode is probably SS0540, for reverse polarity protection. if its burned out, you could try replacing only the transistor (which is general purpose PNP MMBT3906) and leave the diode open (remove the debris of the burnt out component and not replace with a new component) although you would need to be very careful in ensuring that you connect with the correct polarity of the charger. If you connect the wrong polarity and there's no diode in place then it will burn up a lot more components! has anyone had any success by replacing the transistor? I had a look at the circuit diagram and seems that the diode is only for reverse polarity protection and can probably be removed as long as the power is correctly connected. so the question is - will it work if only the transistor is replaced?